Here are three apps that can help you get focused again, and stay there ... at least until your next day off. I created a Trello board called "Work Projects." Within that board, I made a list for every day of the workweek. For each day, I add multiple cards, and each card represents a to-do item related to a project. Here are three apps to help you get back into the swing of things after the Fourth of July holiday. 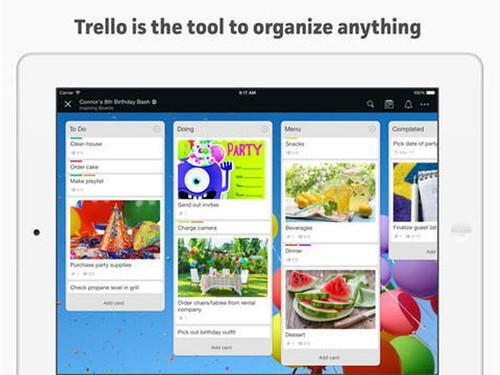 To help you get going, spend a few minutes tinkering in Trello, the freemium cloud service with mobile apps that acts as a digital whiteboard for all of your projects. I created a Trello board called "Work Projects." Within that board, I made a list for every day of the workweek. For each day, I add multiple cards, and each card represents a to-do item related to a project. When I complete tasks, I can archive or delete the related cards. If the task isn't finished by the end of the day, I drag and drop it to the next day's list. RescueTime, another freemium cloud service, helps you stay focused by showing you where you spent your time and how productive (or unproductive) you were. The service uses desktop software and a free Android app to track your activities. For instance, RescueTime can show you how much time you spent on Facebook compared to time spent in Microsoft Word. You can also set goals, such as spending less than 1.5 hours per day on email. (Good luck with that). The premium features costs $9 a month, and they include alerts and the ability to enter time spent offline. When you return to work after an enjoyable summer vacation, it is a good time to reassess your job progress, and career or life goals. It's also officially the halfway point of 2015 -- New Year's resolution time will be here in about 20 minutes, give or take. I started using Evernote to list my personal and professional goals using a workflow outlined by the Evernote blog last December. Evernote is everywhere -- Windows, Macs, iOS, Android, Web browsers -- so you can easily access, update and revise your goals anytime. And you can save online articles and email related to your goals to Evernote, so you have supporting information handy whenever you want it. Evernote's free plan may be all you need, but if not, Evernote Plus costs $25 per year, and Premium costs $50 a year. There is also a Premium Business plan (rates vary). I use the Premium plan and highly recommend it.